A popular trend in revenue management captures the behaviour of customers that choose between different available products. The provided solution methods assume that there is no uncertainty in the parameters of the model. However, in practice the parameters may be uncertain, e.g., because of estimation errors. A relatively recent field of optimisation that takes into account uncertainty in the optimisation procedure is robust optimisation. Robust optimisation methods provide solutions where the worst-case scenario is optimised, taking into account uncertainty in parameters. 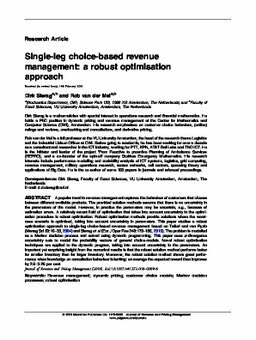 This paper studies a robust optimisation approach to single-leg choice-based revenue management based on Talluri and van Ryzin (Manag Sci 50:15–33, 2004) and Sierag et al (Eur J Oper Res 246:170–185, 2015). The problem is modelled as a Markov decision process and solved using dynamic programming. This paper uses ϕ-divergence uncertainty sets to model the probability vectors of general choice-models. Novel robust optimisation techniques are applied to the dynamic program, taking into account uncertainty in the parameters. An important yet surprising insight from the numerical results is that the robust solution method performs better for smaller inventory than for larger inventory. Moreover, the robust solution method shows great performance when knowledge on cancellation behaviour is lacking: on average the expected reward then improves by 2.5–3.25 per cent.